The Eurasian Economic Union (EEU) and Vietnam have signed a free trade zone agreement. It became the first international document on creating a free trade zone between the EEU and a third party. 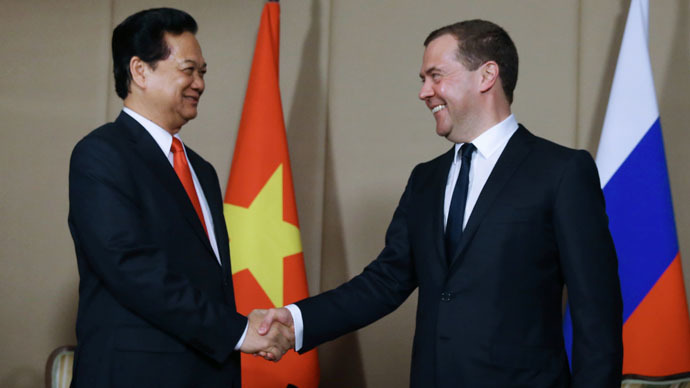 The prime ministers of Russia and Vietnam Dmitry Medvedev and Nguyen Tan Dunghave also signed an agreement for Vietnam to provide Russian investors and service distributors with the most favorable treatment. The EEU will sign free trade zone agreements with other countries, Medvedev said after signing the agreement with Vietnam. "Around 40 states have opted for holding talks on concluding this kind of agreements on a free trade zone with EEU, and of course we will be thinking this through as carefully as possible, so that those agreements are useful to our countries," Medvedev said. The free trade zone will save exporters from the EEU about $40-60 million in the first year of its operations, according to the documents prepared for the signing ceremony, TASS reports. “At the end of transitional periods, the positive effects from lifting customs duties may reach around $55 million-$60 million a year,” the documents added. Vietnamese companies, in turn, can expect savings of up to $5 million-$10 million a year. A free trade agreement with Vietnam will enter into force 60 days after it’s ratified in accordance with national legislation in all EEU countries and in Vietnam, according to Andrei Slepnev, minister of trade of the Eurasian Economic Commission (EEC).Slepnev said he hoped all the countries would ratify the agreement during the autumn session. This was the first such agreement with foreign countries for all EEU members, said Slepnev. "This shows that we are in a trend of world trade processes. If all today’s world initiatives are implemented, in five or six years up to 60 percent, or, as some experts believe, even up to 80 percent of all world trade will be carried out in a free trade regime compared to 25 percent nowadays,” he said. Thus, the WTO becomes a necessary but still insufficient condition, as most world trade will go through free trade zones, he said. “It's a totally new challenge. We had been in the process of joining the WTO for 18 years, but now I understand that our export ambitions can only be realized if we will fit the concept of a new international trade model," Slepnev added. Chairman of the Board of the Eurasian Economic Commission Viktor Khristenko called the agreement: “A historic act." "The agreement covers not only the preferential regimes, but also the issues of managing intellectual property rights and a number of other areas,” he said. Trade between the two parties is expected to grow to $10 billion by 2020 from the current $4 billion, he added. The agreement will also open up ‘good opportunities’ for the EEU entrepreneurs, Slepnev said. They’ll get access to a 90 - million people market, as well as the opportunity to enter the markets of other ASEAN countries and the Asian region as a whole, he added. The agreement will also open up "good opportunities" for EEU entrepreneurs, Slepnev said. They’ll get access to a 90-million people market, and the opportunity to enter the markets of other ASEAN countries and the Asian region as a whole, he added. The deal to establish the Eurasian Economic Union (EEU) was signed by the presidents of Russia, Belarus and Kazakhstan on May 29, 2014 in Astana. The EEU, which came into effect onJanuary 1, 2015, is designed to ensure the free movement of goods, services, capital and workforce on its territory. 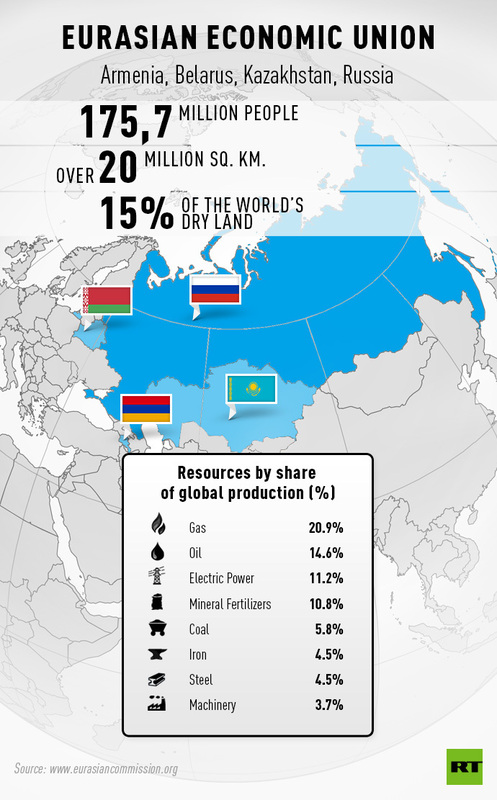 The EEU currently comprises Russia, Belarus, Kazakhstan and Armenia. Ratification procedures are currently under way for Kyrgyzstan to join the trade bloc.